Rewards Canada: Scotiabank Gold American Express Card - First Year Free with a 20,000 points sign up bonus! 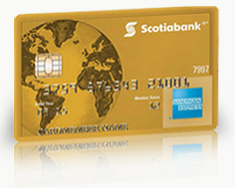 Scotiabank Gold American Express Card - First Year Free with a 20,000 points sign up bonus! $99 annual fee (among the most competitive fee for a premium travel reward card currently on the market). Additional card annual fee is $29 and the interest rates are 19.99% on purchases and 21.99% on cash advances, balance transfers and Scotia Credit Card cheques.